Here’s another cruel and unusual punishment applied to the poor benzene ring. Hashimoto,et al. 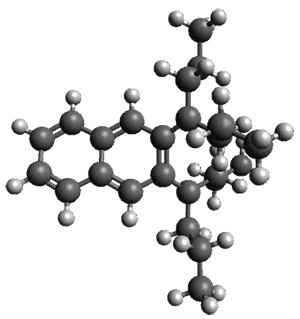 have created a molecule that is a fused double helicene, where the fusion is about a single phenyl ring.1Compound 1 has two helicenes oriented in opposite directions. 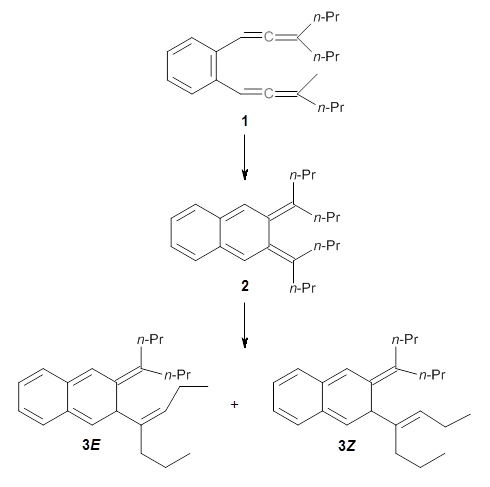 This should provide a twist to the central phenyl ring, and the added methyl groups help to expand that twist. 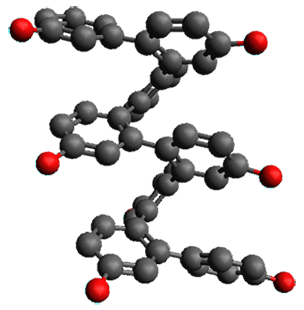 They prepared 1 and its x-ray crystal structure is reported. The compound exhibits C2 symmetry. The twist (defined as the dihedral of four consecutive carbon atoms of the central ring) is 28.17°, nearly the same twist as in paraphenylene. 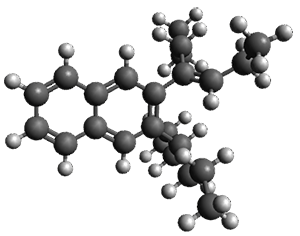 The B3LYP/6-31G(d) structure of 1 is shown in Figure 1. This geometry is very similar to the x-ray structure. The calculated NICS value for the central ring is -4.9 (B3LYP/6-311+G(d,p)/B3LYP/6-31G(d)) and -4.3 (B3LYP/6-311+G(d,p)/x-ray structure). This diminished value from either benzene or C6(PSH2)2(CH3)4 indicates reduced aromaticity of this central ring, presumably due to the distortion away from planarity. 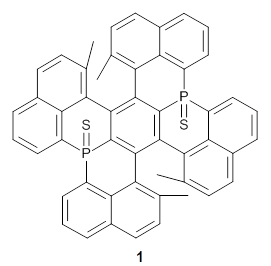 Nonetheless, the central ring of 1 is not oxidized when subjected to MCPBA to oxidize to the bis phosphine oxides. Figure 1. 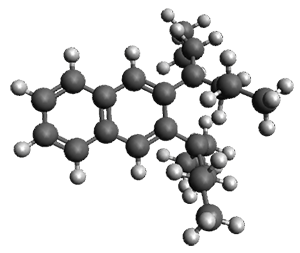 B3LYP/6-31G(d) optimized structure of 1. (1) Hashimoto, S.; Nakatsuka, S.; Nakamura, M.; Hatakeyama, T. "Construction of a Highly Distorted Benzene Ring in a Double Helicene," Angew. Chem. Int. Ed. 2014, 53, 14074-14076, DOI:10.1002/anie.201408390. Kiss, Gyöngyi N., et al. "Virtual screening for LPA2-specific agonists identifies a nonlipid compound with antiapoptotic actions." 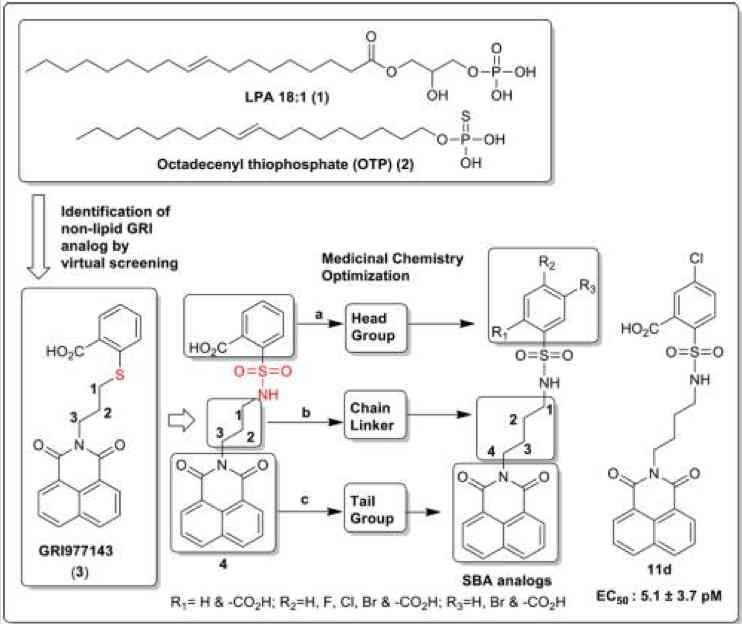 Molecular Pharmacology 82.6 (2012): 1162-1173. Patil, Renukadevi, et al. "Design and Synthesis of Sulfamoyl Benzoic Acid Analogues with Subnanomolar Agonist Activity Specific to the LPA2 Receptor." 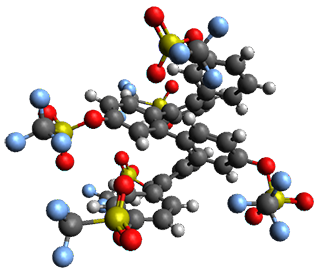 Journal of Medicinal Chemistry 57.16 (2014): 7136-7140. 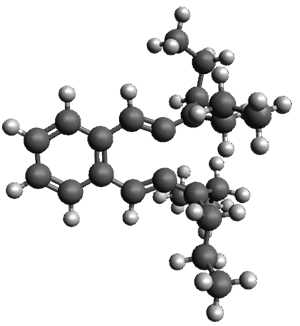 The process began many, many years ago when, with medicinal chemist colleagues, we introduced simple modifications into the natural compound and that got us somewhat towards the ultimate goal of making a drug-like substance, but it didn't work very well. So then using computers to design drugs, we have been able to screen millions of compounds and we have found structures that fit in like a key into the keyhole. The reference is a PhD thesis, which I haven't read but, but the word "serendipitously" leads me to suspect that there is an interesting story here. Anyway, NSC12404 was used as basis for a similarity search of the UC-DCC chemical library using Pipeline Pilot from Accelerys and the 225 returned hits were trimmed down, using the diversity subset function in MOE, to 27 compounds for experimental testing. Of these 3 (Figure 1) proved the most promising. Orbital-free DFT[1,2] is a linear-scaling approach to DFT which returns to the original spirit of DFT and Thomas-Fermi theory, in seeking only the charge density of the system. The potential computational saving is immense, as we only have to consider one three dimensional variable rather than enough variables to describe the orbitals of the system. As there is no diagonalisation or orthogonalisation step, we achieve linear scaling. However, there are two considerable problems with the method: first, the kinetic energy functional, which is not known; second, the potential due to the ions. It is this second problem that a recent paper seeks to address, by using the projector-augmented wave (PAW) method. There has been considerable research on possible kinetic energy functionals for use in OFDFT, with two key approximations: the Thomas-Fermi (which uses a simple power of the density); and the von Weizsacker (which considers the gradient of the density as well as the density). Most OFDFT approaches mix these at some level, and research into new functionals is on-going. The second problem, with potentials due to the ions, is significant. Since the only variable considered by the OFDFT method is the density, which is a local function, the potentials used must also be local. (In solid-state approaches, pseudopotentials are almost always non-local, that is functions of two points in space, which is possible as we are acting on different orbitals with different energies; the non-local form makes the pseudopotentials significantly more transferrable.) There has been work on developing transferrable local potentials for OFDFT, but this still presents a significant challenge. Given this problem, an approach that uses the bare Coulomb potential is attractive. Most OFDFT approaches use a grid-based approach, which makes the use of the bare Coulomb potential challenging, and the proposal to introduce PAWs for OFDFT is attractive. But PAWs have the same requirement that non-local pseudopotentials do: they use multiple projector functions in multiple angular momentum channels, and are generally non-local. The authors do not address this question clearly: there is a passing statement that all quantities are generated as for a 1s orbital (i.e. spherically symmetric), and a single note that only one partial wave is used. This assumption really deserves more discussion, and investigation: since the projectors are operating on the density (or more properly its square root), it is not clear whether the PAW method can be used faithfully in this context. The results presented lead to further questions. 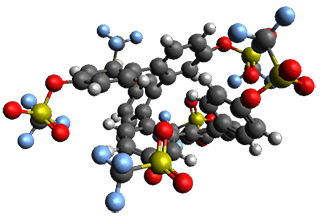 While isolated binary molecules are represented reasonably well, this is not a significant test of the method. The bulk results are more concerning: the lattice constant and bulk modulus for lithium and carbon are very poorly described, and the authors introduce a new parameter to the kinetic energy, which they adjust to match the lattice constant. While the idea of combining PAWs and OFDFT is an interesting one, the present paper leaves many unanswered questions, most relating to the implementation. It is far from clear that the use of a single partial wave for PAW offers any advantage over the local pseudopotential approaches already proposed for OFDFT, and while the implementation in an existing code is simple, much more work is needed to test the reliability of the method. They synthesized two isomeric o-phenylenes, differing in the substitution pattern (1 and 2), with chain length of 6 to 10 phenyl rings. Substituents included methoxy, acetoxy, nitrile, and triflate. They principally employed 1H NMR to assess the conformational distribution, and used computations to confirm the conformation. 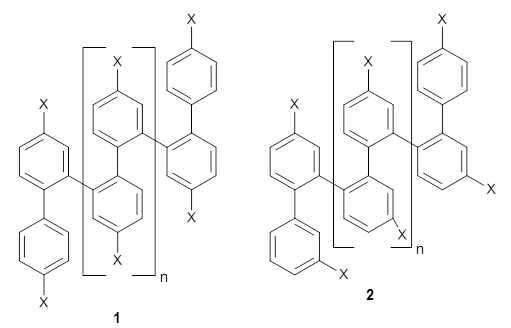 Ideally folded conformations of 1 and 2 with eight phenyl rings are shown in Figure 1. 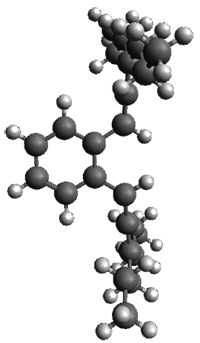 The dihedral angle formed by two adjacent phenyl rings are typically about ±55° or ±130°. Figure 1. Idealized folding of 1 and 2 with X=OH. 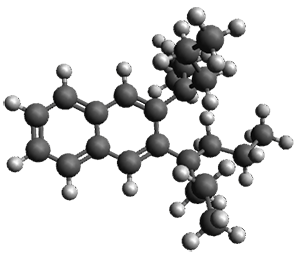 Given the size of these systems, and the conformation flexibility not just of the chain but with each substituent, a full search to identify the global minimum was not undertaken. 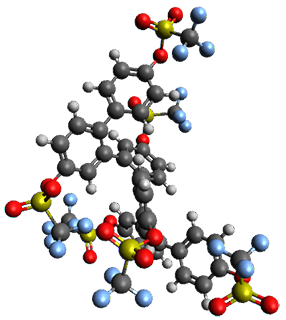 Rather, a library of conformations was generated with MM, the lowest 200 conformations were then reoptimized at PM7 and then the energies were determined at PCM/B97-D/TZV(2d,2p). The lowest energy conformer was then reoptimized at this DFT level. Three conformations of 3 and 4 are shown in Figure 2 with triflate as the substituent with six phenyl rings. The first conformer has optimal stacking (perfect folding), the second conformer as one misfold at the end, and the third conformer has no stacking at all. Figure 2. Optimized geometries of conformers of 3 and 4. 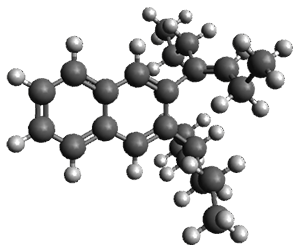 NMR chemical shifts were then computed using these geometries at PCM/WP04/6-31G(d). In all cases examined, the chemical shifts of the major conformation was confirmed to be the perfect folding one by comparison with the computed chemical shifts. 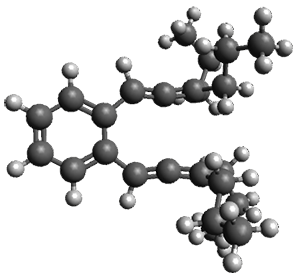 The examined substituents enhanced the proportion of properly folded chains in all cases, often to the extent where no minor conformer was observed at all. (1) Mathew, S.; Crandall, L. A.; Ziegler, C. J.; Hartley, C. S. "Enhanced Helical Folding of ortho-Phenylenes through the Control of Aromatic Stacking Interactions," J. Am. Chem. Soc. 2014, 136, 16666-16675, DOI:10.1021/ja509902m. What brings a chemist to post about a joint paper of a professor from a school of pharmacy and one from a department of materials science? A great multidisciplinary paper! This paper is a tour de force for computational materials science. 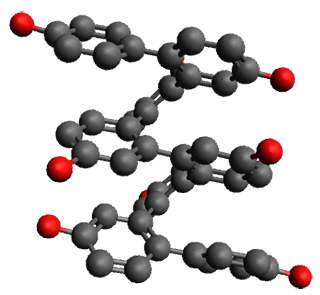 The authors, from the Tropsha and Curtarolo groups have applied state-of-the-art tools from chemoinformatics and machine learning to the challenging problem of materials design. In this paper, led by Olexandr Isayev, the authors employ chemical descriptors based on electronic properties such as the density of states, as well as local properties such as the modified simplex approach to catalog materials and their properties. They apply the methods to the large datasets compiled by the Curtarolo group and find very interesting domains of material space once they apply the Tanimoto similarity metric. The authors generate networks that they call materials carotgrams, where the nodes are compounds and the connections are the similarities between them. It is nice to see that naturally, regions of similar physicochemical properties emerge from their analysis. As with all these methods, the proof is in the pudding, and the challenge to this great collaboration is to propose a material that has not been synthesized yet, and show it has better properties than any other material out there. They looked at a set of 60 reactions which involve a reactant with π-conjugation and a product which lacks conjugation. A few examples, showing examples involving linear and cyclic systems, are shown in Scheme 1. The reaction energies were evaluated at W2-F12, which should have an error of a fraction of a kcal mol-1. Three of the reactions can be compared with experimental values, and difference in the experimental and computed values are well within the error bars of the experiment. It is too bad that the authors did not also examine 1,3-cyclohexadiene → 1,4-cyclohexadiene, a reaction that is both of broader interest than many of the ones included in the test set and can also be compared with experiment. These 60 reactions were then evaluated with a slew of functionals from every rung of Jacob’s ladder. The highlights of this benchmark study are that most GGA and meta-GGA and hybrid functionals (like B3LYP) have errors that exceed chemical accuracy (about 1 kcal mol-1). However, the range-separated functionals give very good energies, including ωB97X-D. The best results are provided with double hybrid functionals. Lastly, the D3 dispersion correction does generally improve energies by 10-20%. On the wavefunction side, SCS-MPs gives excellent results, and may be one of the best choices when considering computational resources. (1) Yu, L.-J. ; Karton, A. "Assessment of theoretical procedures for a diverse set of isomerization reactions involving double-bond migration in conjugated dienes," Chem. Phys. 2014, 441, 166-177, DOI:10.1016/j.chemphys.2014.07.015. Histone deacetylases (HDACs) are a family of enzymes involved in gene expression and post-translational modifications. HDACs are very important targets for drug development due to their roles in cancer and other diseases. 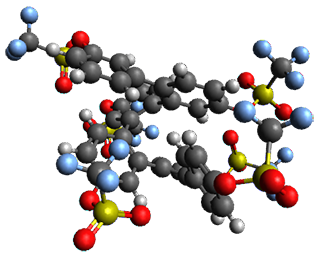 Several HDAC inhibitors have been developed, however, many known inhibitors produce side-effects because of their poor selectivity. 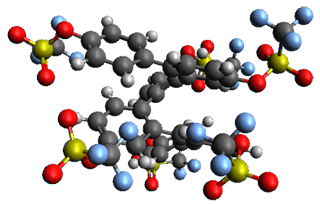 This paper presents a striking example of how state-of-the-art QM/MM-MD calculations can be used for computer-aided drug design (CADD). Based on their previous calculations on the mechanism of the wild-type enzyme, Zhou and co-workers hypothesized that a selective inhibitor could be created by developing a molecule that would undergo an HDAC-catalyzed intra-molecular reaction. To this end, the authors proposed several candidates and used QM/MM-MD simulations to study the mechanism in gas-phase, solution and in the enzyme active site. The most promising candidates ( –hydroxymethyl and –aminomethyl substituted chalcones) were subsequently synthesized and characterized in vivo. The authors further analyzed the mechanism of inhibition via QM/MM-MD for the most promising candidate to understand how this molecule acts as an HDAC2-selective, time-dependent inhibitor. Reprinted with permission from ACS Chem. Biol. , Article ASAP DOI: 10.1021/cb500767c . Copyright (2014) American Chemical Society. Schmittel has examined the thermolysis of 1, which undergoes a Garratt-Braverman rearrangement followed by a [1,5]-H migration to produce 3.1 The product 3 is formed in a 10.3:1 ratio of E to Zconsistently over the temperature range of 60 – 140 °C. This non-changing ratio is unusual. The difference in the computed (UB3LYP/6-31g(d)) free energy of activation for the step 2 → 3 ranges from 2.35 to 2.56 kcal mol-1 for this temperature range, manifesting in a predicted E:Z ratio of 24.9 at 60 °C to 22.7 at 140 °C. The computed structures of 1-3 along with the transition states are shown in Figure 1. The activation free energy for the first step (Garrat-Braverman) is 30.9 kcal mol-1. This is about 30 kcal mol-1 larger than the barrier for the second step. Schmittel suggests that a non-statistical effect is manifesting here. The molecule crosses the first TS and then follows a downhill path directly over TS2E without spending any time in the region of the intermediate 2. A few computed trajectories all indicate that it takes less than 50 fs from the time the reaction crosses TS1 until the hydrogen migrates, supporting the notion that vibrational relaxation within the intermediate 2 is not occurring. This reaction is yet another example of dynamic effects dictating product distributions. 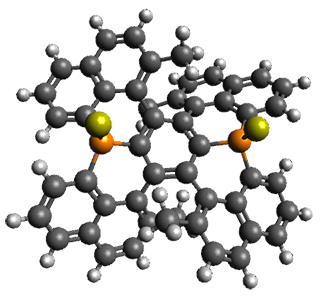 1) Samanta, D.; Rana, A.; Schmittel, M. “Nonstatistical Dynamics in the Thermal Garratt−Braverman/[1,5]‑H Shift of One Ene−diallene: An Experimental and Computational Study,” J. Org. Chem. 2014, 79, 8435–8439, DOI: 10.1021/jo501324w. 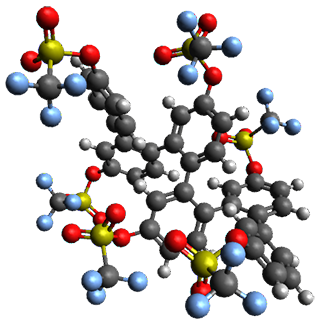 Computational Chemistry Highlights received 27,924 pageviews in 2014. The are many ways to stay updated on the latest CCH highlights and CCH currently has 167 subscribers on Feedly, 204 twitter followers, 520 Google+ followers, 84 Facebook followers, and 130 followers on Linkedin.